In a constantly-evolving tech landscape that can move at an exhaustingly tireless pace, the year 2018 has already brought us ever-growing funding rounds, new financial regulatory rulings delineating what is and what is not a security, and a sudden interest in *checks notes* scooters. We've also digested headlines of trade wars and geopolitical turmoil with varying effects on the public market. But how does all of this factor into the psyche of the private market investor? Past performance is not indicative of future results. It is not possible to invest directly in an index. Luckily, there's a great resource to help answer this question: EquityZen's Market Sentiment Index (EZMSI). In this article, we'll take a dive into what the EZMSI actually is, how to read it, and what it tells us about sentiment in our current climate. Though this is just a snapshot, be sure to sign up for our platform to access the live version of the EZMSI and get real-time updates on private market sentiment! What is the EZMSI and what does it say about the here and now? The EquityZen Market Sentiment Index is a chart intended to measure and communicate the attitudes of market participants (that is, buyers' and sellers') towards the current state of the private market. It is important to remember that—as with public markets—market sentiment measures are not always based on fundamentals. This tool serves more so as a general barometer of the bearishness or bullishness of participants in the market. The index itself is a relative measure during a given period of time, which in this case is the last two years. In other words, the most bullish point over those 24 months will be indicated by a score of 100.0 and the most bearish point a score of 0.0. Our most recent calculation was for the month of May 2018, which came in at 75.1, a generally bullish figure. Compare that score to just a year ago and we're at roughly 5x the bullishness of May 2017. In fact, we can see that we've experienced quite a run of bullish fervor beginning at the start of 2017, with absolute zero coming in March 2017, reaching a peak in December 2017, and then cooling ever so slightly throughout 2018. Looking over a trailing two year period allows us to view trends with greater context, providing perspective when assessing overall sentiment, rather than simply focusing on a passing run or scare. Bullish attitudes in 2017-2018 should come as no surprise to the engaged investor. Better yet, it shouldn't raise an eyebrow for anyone who has flipped on CNBC, scrolled through the Wall Street Journal, or stumbled into the questionably-entertaining void that is Finance Twitter. Why? Well, the public markets have been absolutely on fire ever since the Great Recession fully bottomed-out in 2009. The chart above shows the Dow, NASDAQ, and S&P 500 index prices for the last decade. Up and to the right, as they say. The interesting piece here for the private markets is that we can potentially see two forces at work: 1) this historic public market run has been so lucrative for some that they are comfortable increasing their allocation to alternative assets associated with a larger risk appetite (such as pre-IPO, private market tech stocks), or 2) people are aware that bull runs—no matter how strong our pointed appeals to the contrary—cannot extend indefinitely, and so in advance of a market slowing or downturn, investors want to diversify their portfolios in an effort to mitigate the risk that overexposure to the public markets creates. While not a perfect correlation by any means, public market bullishness usually generates overall bullishness towards the activity of investing on the whole. Any private market factors at work here? In case you're just waking out of a six-month slumber, 2018 has already been crowned the "return of the IPO." Household names like Spotify, DocuSign, and Dropbox have all hit the public market to mass fanfare, driving the public discourse around private markets and scoring large returns for investors along the way. The fun doesn't stop there: well-known tech players GitHub and Glassdoor, among others, have gone the route of corporate acquisition to achieve an exit. With recent filers in Domo and Bloom Energy (not to mention Adyen's recent eye-popping IPO), 2018 shows no signs of slowing down any time soon. To find out which companies are on our exits radar for the second half of the year, check out our 2018 IPO Outlook here. Of course, we'd be remiss not to note that companies are simply staying private longer. Particularly with the advent of megafunds like Softbank that can flood large private companies with multi-hundred million dollar funding rounds, more and more pre-IPO private companies are choosing this source as a favorable alternative to opening their operations and books to public scrutiny. Is that the full picture? Oh, right: crypto happened. We cannot forget nor dismiss the buzziest topic of 2018Q4. For better or worse, cryptocurrencies dominated the daily watercooler chat (and some fintech company chat rooms...), captivating us all by growing 1000%+ in a matter of months in the case of some coins, and roaring forward to a total market cap nearing $1T. Crypto-fever came to a head right around December 2017-January 2018, just the same as our index. Does this mean our EZMSI is a terrific proxy for crypto sentiment as well? No, it does not. 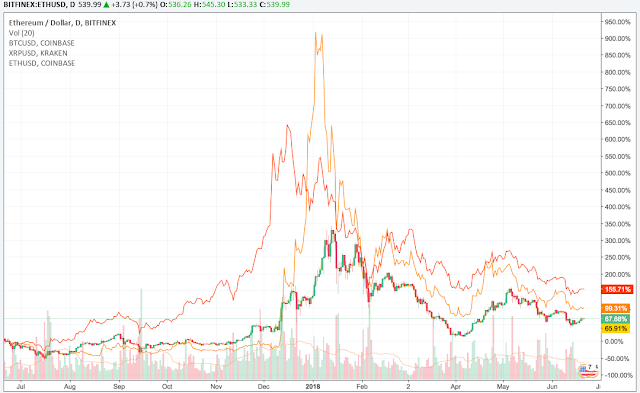 Even though the cryptocurrency markets and the EZMSI both peaked around the same time in December 2017, they are tracking sentiment towards different asset classes, and there is no definitive correlation between the two. However, it is reasonable to acknowledge the emergence of cryptocurrencies as a new asset class—an undeniably speculative, yet lucrative one at that. This may have been a signal to public market investors that they should diversify into other, non-traditional asset classes as well, forcing them to look outside of standard stocks and bonds. The overall idea that an international phenomenon such as crypto, something that is so wholly steeped in investing, technological disruption, and ideas of the "future," can shine a light on new investment alternatives is something that must be considered when looking at macro forces impacting private market sentiment. Curious to learn more about our Market Sentiment Index or various other fun dives into the private markets? Check out our Blog and Knowledge Center for invaluable resources on these topics!